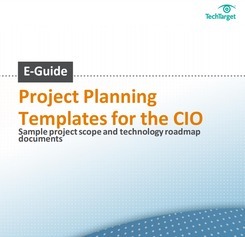 SearchCIO.com is providing their e-guide Project Planning Templates for the CIO to walk you through all the steps of a successful IT project. From establishing project scope to outlining a technology roadmap, this exclusive e-guide contains all the tips, tricks, and free templates you need to effectively manage your project. All you need to do is complete our brief survey to access your complimentary download.